After a successful two years, the Embrace project, run by Father Hudson’s Care is drawing to a close. Based in the Worcester deanery, Embrace has worked alongside parishioners to support them to find new ways to reach out to isolated elderly residents. The project saw Father Hudson’s Care work in partnership with Caritas Salford, Catholic Care Leeds and the Catholic Social Action Network (CSAN). Together, these organisations were part of a pilot project, testing ways of empowering parishioners to reach out to isolated people in their area. 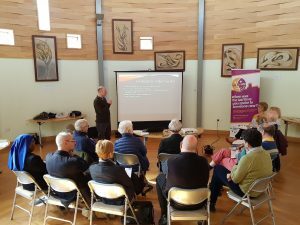 On Monday 25 March, Father Hudson’s Care held a workshop at St George’s church in Worcester to share its learning. Representatives attended from parishes across the Archdiocese, including priests and parishioners from Stoke, Bloxwich, Pershore, Worcester, Oxford and Reading. Working with parishioners to set up a friendship group. This group meets once a month and organises regular walks for local people. It has also set up a gardening project. 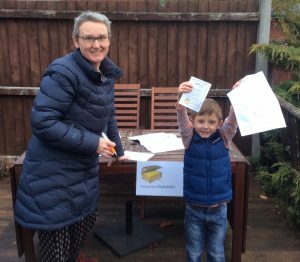 Organising a treasure hunt, which brought together people of all ages and backgrounds. Setting up a Penpal scheme linking local primary schools and care homes. The scheme has allowed children and older residents to get to know each other and share experiences. It also offers a chance for the two generations to meet up from time to time. ‘Talk to me Worcester’ – a ten week social media campaign that encouraged parishioners to organise activities that enabled them to get to know their neighbours better. The friendship group and Penpal scheme will continue after the project has closed. Over the two years, Embrace engaged more than 200 beneficiaries and supported over 40 people to volunteer. During the workshop, attendees also heard about how parishes are already reaching out to isolated residents in their local areas. A toolkit will be launched in the coming months, bringing together learning from all organisations involved in the project. This will enable other parishes to develop their own services to reach people in their own communities. This entry was posted in Father Hudson's Care and tagged Embrace, Father Hudson's Care, Father Hudson's Society, isolation, Worcester by Caritas. Bookmark the permalink.